You are most likely here because you are a developer and you want to find out how to achieve getting WordPress data into a spreadsheet, however on the off-chance you are a business and you want some custom work or consultancy relating to WordPress please contact me via this link. 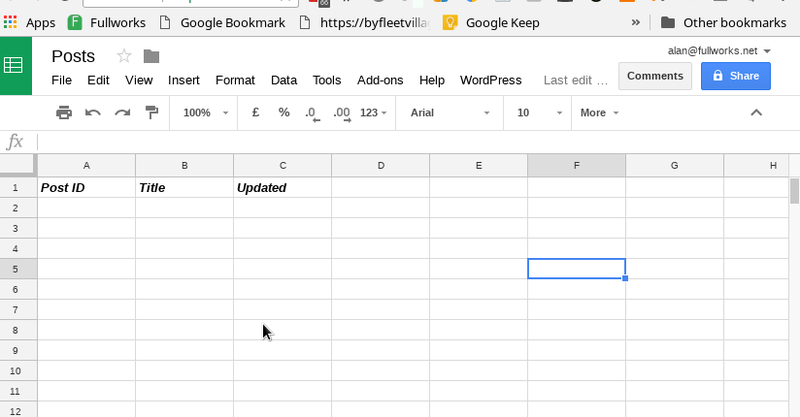 Start a new blank spreadsheet and change the title from ‘untitled spreadsheet’ to something, anything, you like. Then, go to the menu Tools > Script Editor and open up a new script, also change that from ‘untitled project ‘ to a name you like. Under the WordPress tab is a sub menu – Get Posts – click on it and see the magic happen. This function is fired automatically when the spreadsheet page is opened ( or refreshed ). It builds the menu ‘WordPress’ and a sub menu ‘Get Posts’ that calls our processing function getPosts(). I also have a function setupSheet() called which I will explain next. 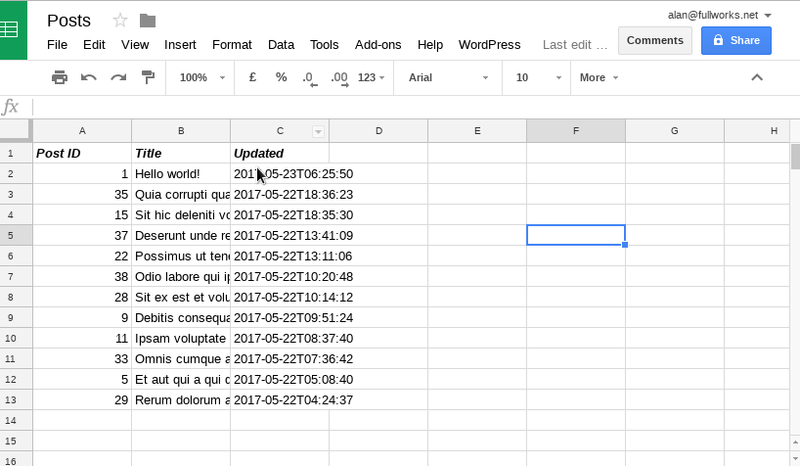 The main purpose of this function is to clear any data in the spreadsheet and then add headings to each column, in this case, keeping it simple, is just post id, post title and date modified. You can of course extend this as you like. This does two things, first it clears the sheet ( again ) and then it loops through ‘pages’ of posts. The WP REST API limits the amount of post that can be retrieved in a single call to 100, and the default is 10. The limit is there to protect your website, but it does means we need to loop multiple times and keep track of what we have got. So we start with and ‘offset’ of zero and call the getPage() function until getPage() returns zero, if getPage() returns a +ve number ‘got’ we add that to the offset and go again. The key call is var response = UrlFetchApp.fetch(url, options); which pull back from the ‘url’ based on the ‘options’ which in this example is http://demo.wp-api.org/wp-json/wp/v2/posts with query args of per_page and offset ( as you recall we increment offset ) and the function returns the number of rows – you may think that is always 10, but that isn’t always so, for instance 14 posts is one page of 10 and one page of 4. Once we get the response we use JSON.parse(response) to build a map ( array for PHPers) of the posts and we loop through those and push them into the appropriate row & column, taking into consideration the header row and the offset. I have also built a script to handle Woocommerce regular-price updates based on the principals in these tutorials, if there is interest in the write up – or even as a straight add-on please leave a comment. Little bit off topic, this is exactly what I want but to connect to dropbox csv files. Would you know how I could go about that or have a link to somewhere that possibly could help out with that? Great article. Is it possible to link categories and tag into 2 different Columns? If yes how can I edit your script? Thanks again!